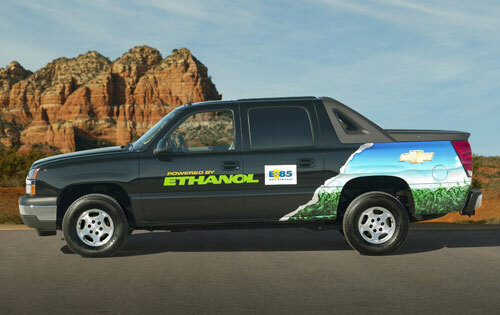 E85 is the term for motor fuel blends of 85% ethanol and just 15% gasoline. It is a renewable biofuel designed for use in Flexible Fuel Vehicles. Ethanol is an alcohol made from grain and other starch crops like barley and wheat that have been converted into simple sugars and then fermented and distilled. Ethanol has been used in cars since Henry Ford designed his 1908 Model T to operate on alcohol. E85 keeps your fuel system clean because it burns cleaner than regular gas or diesel and doesn't leave behind gummy deposits. Not concerned about engine life? Then perhaps performance is important to you. E85 has the highest octane of any commercially available automotive fuel at more than 100. This compares very favorably to the octane rating of regular unleaded of 89 or premium of 93. The performance characteristics of ethanol are sufficient to have convinced The Indy Racing League, which includes the Indianapolis 500, to switch to 100% ethanol starting in 2006 to fuel the race cars. If it's good enough for race cars speeding at over 200 miles per hour, surely it is good enough for your Flexible Fuel Vehicle, too. When you add oxygen to a fire, the flame grows. This same principle happens in your engine. Adding ethanol to your fuel adds oxygen to the fuel. This additional oxygen helps your engine to more fully combust the gasoline. This results in fewer harmful tailpipe emissions like carbon monoxide, volatile organic compounds and other toxic components. The American Lung Association of Illinois credits ethanol-blended fuel with reducing smog-forming emissions. In addition to clean air benefits, E85 is a "Renewable Fuel". Why is it considered renewable? Ethanol is made from grain produced on farms across the country. The energy of sun is captured in the grain as it grows. When the grain is processed into ethanol, the energy of the sun is converted to ethanol. The following season, a new crop is planted and more fuel and energy are harvested. Contrast this to the production of crude oil buried deep within the earth's core. The oil we're burning took hundreds of millions of years to form. Once extracted from the ground, the oil is not renewed... at least for another couple hundred million or so years. When burned, fossil fuels release carbon, once locked deep within the earth's core, into the atmosphere. Science points to these releases as one of the leading causes of global warming. Unlike fossil fuels, E85 actually reduces greenhouse gas (GHG) emissions. The grain or other biomass used to make ethanol absorbs carbon dioxide as it grows. Ethanol use provides benefits to the entire nation. Most Americans do not realize the risk our nation faces as a result of our dependence on foreign oil. The Energy Information Administration (EIA) forecasts the nation's oil consumption will grow 44% between 2000 and 2025. Over this same time period, our dependence on imports will grow from 54% to 70%. In addition to national benefits, ethanol production contributes to economic growth in rural communities across the nation. The combination of spending for annual plant operations and capital spending for new plants under construction added more than $25.1 billion to gross output in the U.S. economy in 2004. In that same year, the ethanol industry supported the creation of more than 147,000 jobs in all sectors of the U.S. economy, boosting U.S. household income by $4.4 billion.